A big THANKS to Gwendolyn Gage who gave me this award. Gwendolyn is a fellow writer and book-lover and this award comes from her blog "Serving Through Words". Check her out along with the story she's writing that can be found at "The Way of Impressions". 1. I've known my hubby since junior high -though we didn't date until college. Good thing for him I was patient! 2. I love mornings--as long as no one talks to me, asks me for anything, or birds chirp. 4. I am an awful bargainer. Um, actually, I don't bargain. Chances are I'll offer you more money than what you are selling for. Just ask Hubby. 5. I'm 6' tall and still wear heels. 7. I have no coordination. That whole "rub your belly and pat your head" thing? No way. There's my 7! As for passing it on, well, I have a hard time choosing so please check out Blogs I Love on my side bar. The ladies there are an amazing and creative bunch who are sure to make you laugh and give you encouragement. I love Godiva chocolates too! And no I didn't know about the free truffle every month! I feel like I've been missing out on life...jk, lol! I can't do the pat your head and rub your tummy excercise either! LOL! Thanks for the kind shout-out for both my blogs. :-) I really enjoyed your answers, and I feel like I know you better already! Oh you have been missing out! Join their Rewards Club the next time you're there, it's free and you get one free chocolate a month. Can't beat that--free chocolate, yum! Love your blog - I added you to my side-bar too:) SO nice to get to know you! Congrats on your award! :) #2 cracked me up! Congratulations, Susan! 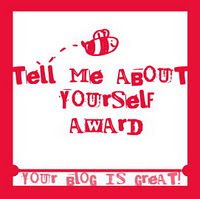 Blog awards are so much fun! Is your husband really tall, too? Neat that you've known each other through lots of changes! Thanks for your comment over at Life Lessons! Funny, I wouldn't have imagined that you were shy! Love how Peter and John prayed for boldness to witness after they had done some time in jail for teaching in the name of Jesus: "And now, Lord, behold their threatenings: and grant unto thy servants, that with all boldness they may speak thy word," (Acts 4:29). Wow! Amazing prayer! Jess - yes, I'm a huge fan of nature just as long as it's silent until I've had my first cup of coffee. Maria - thanks for reminding me of that verse:) And yes, Hubby is tall - I often tease him that that's why I married him.